Many Native American languages are at risk of going extinct. There are more than 7,000 living languages in the world, but UNESCO predicts more than half will be extinct by the end of the century. Will these be among the first to go? 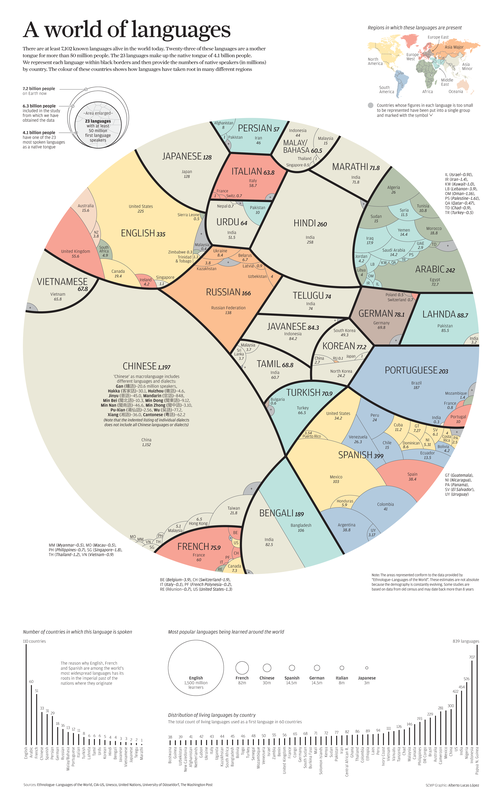 The world's most spoken languages. In 2016, Rosa Andrade Ocagane, the last female speaker of the Amazonian language was murdered in Peru at age 67. She and her brother, Pablo — now Resígaro’s last known speaker, making it one of the most endangered languages — were the children of a Resígaro mother and Ocaina father. They spoke their mother's language to honor her and were also among the last 40 speakers of Ocaina. Russia's 2010 census revealed just 44 speakers of the Chulym Turks' language. Residents of the people's Siberian villages call themselves and their language Ös. They were dropped as a government-recognized ethnic group in 1959, then regained their status back in 1999. This aboriginal Australian Northern Territory language might actually be growing, or at least better documented. Australia’s 2006 Census estimated there were 47 speakers left, but the 2016 report increased to 92 speaking Mudburra at home. As of 2011, there might have been only one native speaker of Patwin, which was spoken by Native Americans in West-Central California. Others have been trying to revive the endangered language, setting up Patwin classes for children from preschool through high school, with some recordings of the teachings found on iTunes. The Ainu people are indigenous to Japan's Hokkaido island, but they’ve largely assimilated into Japanese culture, thanks to late-19th century laws banning Ainu language and traditions. The 1980s marked a revival in the indigenous culture, but its language has between two and fifteen native speakers, and they're all older than 64. It's unknown whether the Peruvian tribe Chamicuro has fully given way to Spanish yet. In 2004, it was reported that there were only two speakers left, but other researchers found eight speakers four years later. Also known as Votic, Vote, Votian, and Votish, this language is spoken by the Votic people, who were deported from the Soviet Union to Finland in 1943. Those remaining who hold on to the language — which is no longer outlawed — live on the border between Russia and Estonia. In 2010, there were 68 native Vod speakers, but in 2017 just eight remained. Before Europeans came to America, between 500 and 800 Native Americans likely spoke the Chemehuevi language, which originated in the Mojave Desert, though less than two dozen speakers are fluent now. Arizona's Colorado River Indian Reservation, for instance, had only three to five native speakers in 2008, the youngest of which was 53. The Kallawaya, a group of male healers in Bolivian villages, pass their secret language down, normally from father to son. Because they don't teach the language widely, it's hard to lock down just how many speakers are left, but most estimates agree there are fewer — perhaps far fewer — than 200 speakers left. Linguists didn't even know this Malaysian language existed until this year, when Swedish researchers realized some locals in a Malay Peninsula village were using vocabulary, grammar, and sounds unique from the Jahai language they were studying. They estimate the village has just 280 speakers. Even though there are more than 3,000 members of the Pawnee Nation of Oklahoma (whose tribe originated in modern-day Nebraska), only a "handful" — likely fewer than 10 — are native speakers of their traditional language. Textbooks and speaking lessons attempt to keep the Pawnee language alive. The ancient language Dunser is still used in special occasions like marriage proposals and weddings in a Papua, Indonesia, island village, but it had just three speakers left in 2011. The two adults, in their 60s and 70s, almost died in earthquakes and floods that threatened the community that year, so Oxford University linguists rushed to document the critically endangered language. Around the Southern Daly River, some indigenous Australians speak Ngan'gikurunggurr, though it’s critically endangered. The 2016 Census found just 26 speakers left. Pan Jin-yu, the last native speaker of the language spoken by a group of aboriginal Taiwanese people, died at 96 in 2010. Even though she managed to give 200 students Pazeh language lessons before passing away, Jin-yu wasn't able to save the language, which is considered extinct. Also known as Galawa or Waliburu, this endangered language is spoken by elderly aboriginal Australians in the Northern Territory. According to the 2016 Census, there were just four speakers left, all of whom are women.